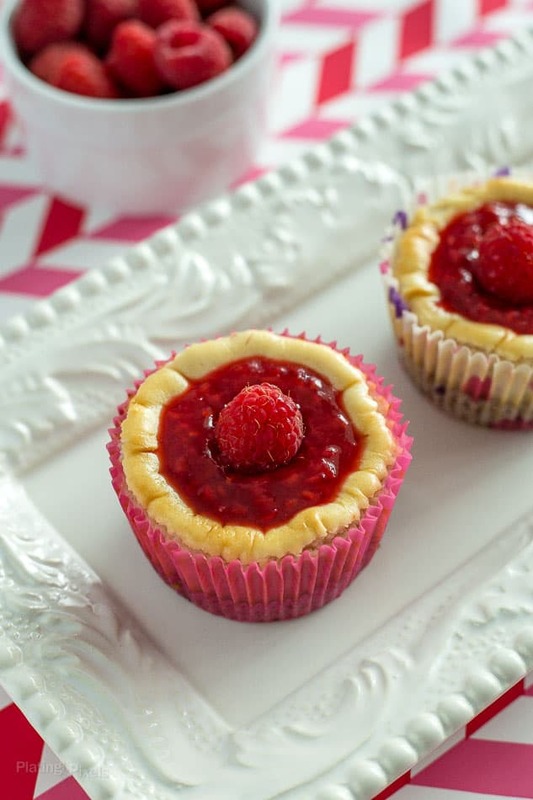 Easy Raspberry Mini Cheesecakes in muffin pans make a fun Valentine’s Day themed dessert for your special sweetheart or children. From-scratch cheesecake filling over a thick graham cracker crust, topped with homemade raspberry sauce. Cheesecakes hold a special place in my heart. There’s something about the sweet, slightly savory, dense and creamy combination of this classic dessert. Speaking of hearts, these Raspberry Mini Cheesecakes would make a perfect treat for that special someone on Valentine’s Day. 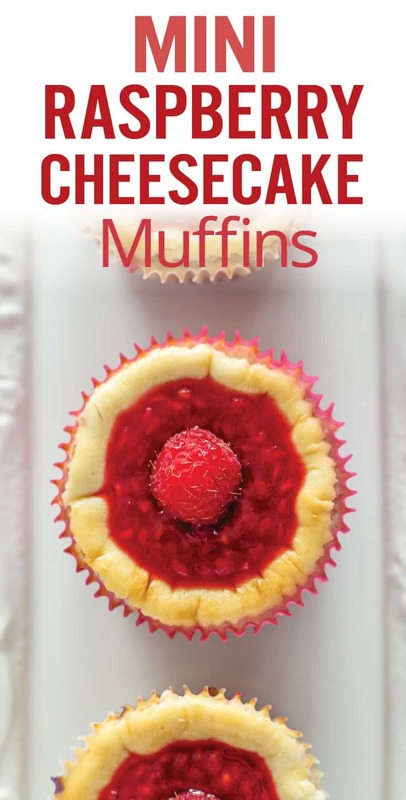 These mini cheesecakes are ideal for sharing and baked in a muffin pan for single serve portions. It’s a unique twist on the classic 9-inch round style. Whether you’re treating yourself to a you-deserve-it dessert, bringing to a party, or sharing with a loved one, these make a fun and tasty treat. Fresh raspberries: whole raspberries are used in the cheesecake batter and the rest are mashed to make the raspberry sauce topping. 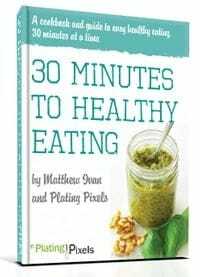 Line a muffin pan with paper liners and lightly coat insides with olive oil spray. Stir together graham cracker crumbs and sugar. Stir in butter until moist. Divide mixture between paper liners, pressing bottoms to form an even layer. Bake 5 minutes, then cool pan on a wire rack. Divide batter between prepared muffin cups with a bit of white chocolate chips in the bottom, filling just below tops, and bake 22 minutes at 350° F.
Cool pan on wire rack to room temp, then chill 4 hours or overnight. 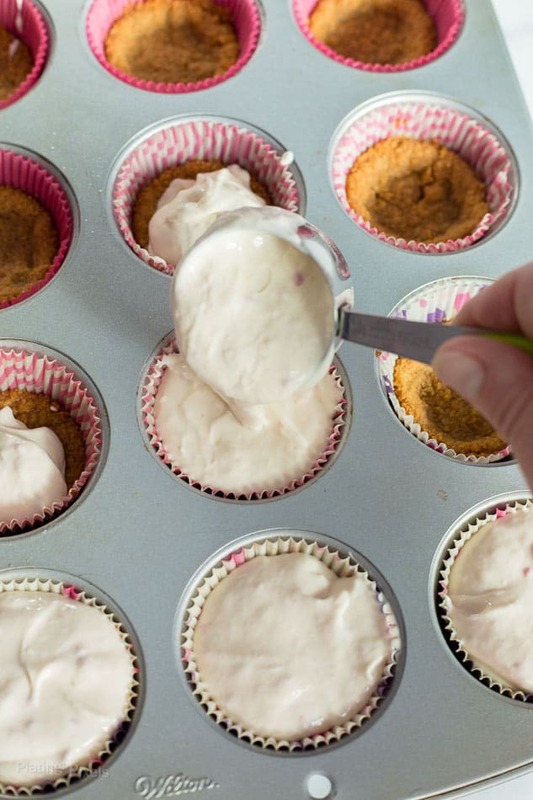 How to prevent Cheesecake Muffins sticking to the muffin liners: Baked in muffin liners, these mini raspberry cheesecakes make for easy cleanup and storing. Use a cooking or olive oil spray to lightly coat the muffin liners. This helps them come out of the liners more cleanly. It’s a little secret I learned, as cheesecake often sticks to muffin liners. Bake in the oven at 350° F oven for 20-25 minutes. 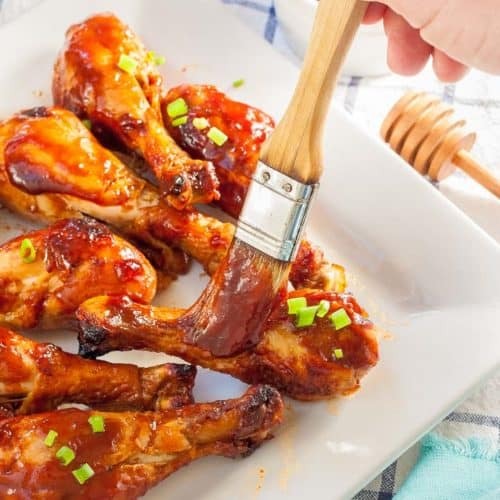 Every oven is different so watch carefully, make sure they are lightly browned on the top, and have slightly wobbly centers. I recommend not opening the oven door until they’ve had at least 18 minutes as they can sink quickly if you open the door too soon. What if my cheesecake cracks or sink? A good batter and proper baking temp and time should reduce this risk. However, it can be common for cheesecakes to sink or dip slightly in the middle, or crack on the top. If this happens a simple way to fix is to add toppings such as jam, frosting, glaze or fresh fruits to cover it up. 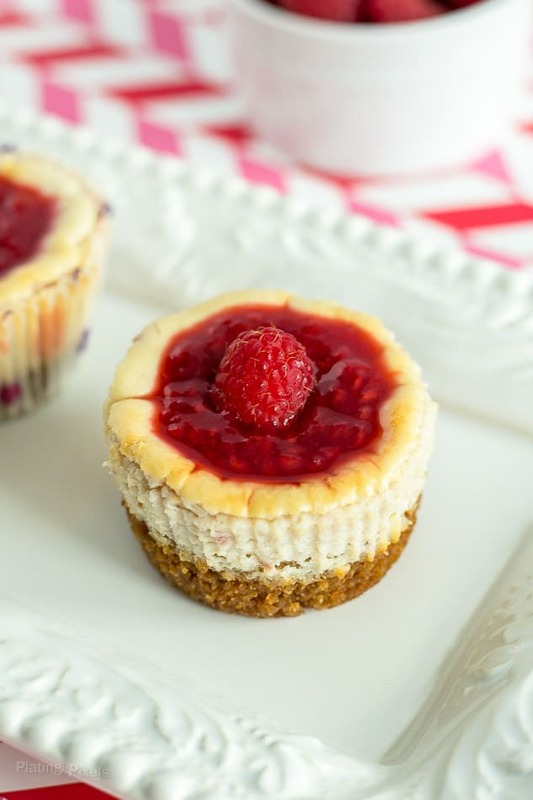 The great thing about these raspberry cheesecakes is that they are topped with a delicious sauce so if you’re serving these to guests they’ll never know! Although cheesecakes are often a simple mixture of cream cheese, sugar, egg and sometimes flour or sour cream, I find recipes can vary in texture and finished presentation. Getting them just right, without cracks or deflating, requires a lot of variables to perfectly align. Although these are Mini Raspberry Cheesecakes you could also use strawberries which would work really well and still look great for a Valentine’s Day dessert. In fact, you could use almost any berry for this recipe including blueberries and blackberries. Graham crackers work really well for the base but you could use other cookies such as ginger snaps, digestive biscuits or even Oreos if you want a chocolate hit. Pro Tip: To make these mini cheesecakes gluten-free swap the Graham crackers for gluten-free cookies or chopped nuts. Mini cheesecakes with from-scratch cheesecake filling over a thick graham cracker crust, topped with homemade raspberry sauce. Preheat oven to 350° F. Line an 18-count muffin pan with paper liners. Lightly coat insides with cooking spray. If you don't have spray, lightly brush insides with oil. Set aside. In a medium bowl, stir together graham cracker crumbs and sugar. Stir in butter until moist. Divide mixture between paper liners, pressing bottoms to form an even layer. Bake 5 minutes, cool pan on a wire rack. Meanwhile: With an electric mixer, beat cream cheese on medium until smooth. Add in sugar until combined, then raspberries until incorporated. Scrape sides of the bowl. Add eggs one at a time on low, mixing completely after each egg. Scrape sides and beat in sour cream and vanilla until combined. Sprinkle some white chocolate chips on the bottom of each prepared muffin cup. Divide batter between cups, filling just below tops, and bake 20-24 minutes. 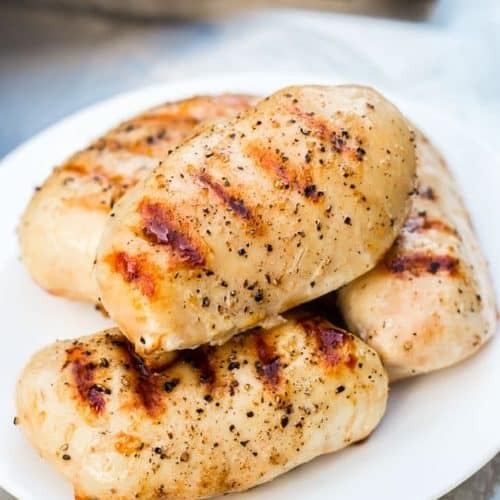 Tops should be lightly browned and centers slightly wobbly. Cool pan on wire rack to room temp, then chill 4 hours or overnight. Centers may dip a bit during cooling. Stir together all sauce ingredients in a pan over medium heat. Bring to a low bowl, stir well and mash raspberries. Simmer 10 minutes to thicken. Bring to room temp then chill. Fill centers with raspberry sauce and fresh raspberries. 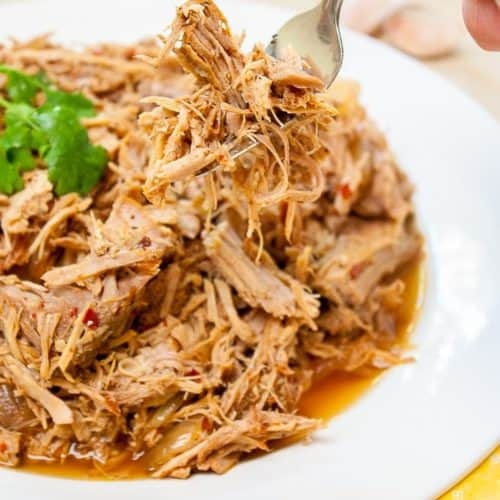 Serve immediately or store in the fridge. So cute and just in time for Valentine’s Day! Yes that’s the difficult part. Thanks Tracy! I am a HUGE fan of allllll the cheesecake! 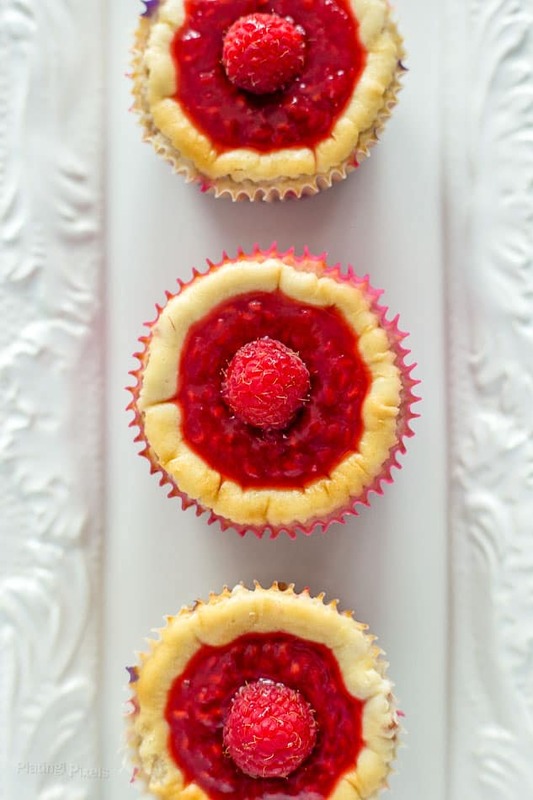 Your mini muffins are reminding me of how my mom used to make use little cheesecakes growing up – she always did strawberry, but I am loving this raspberry version! I wish I had these growing up but glad they’re familiar to you! I bet they’d be great with strawberries as well. I enjoy mini cakes and best when are cheesecake and include my favorite fruit like raspberries looks so good! I agree, mini cheesecakes are great for sharing. Thanks Adriana. This looks like the perfect treat for my hubby who loves cheesecake. I know I would score major best wife points for this one. Love all your tips and tricks. My husband and I are BIG cheesecake fans, but since it’s just the two of us now that my daughter has grown up and flown the coop, a whole cheesecake is way too much. Your mini cheesecakes are the ultimate solution — and your tip to cover any sinkholes or cracks with jam is genius — because that ALWAYS happens to me.